The offsite season is here. It’s a great opportunity to come together after the summer to review and check whether you’re on track to reach your goals, energize the team and make adjustments in your plans if necessary. To get the most out of your next offsite, here are 10 practical tips for how Slido can help you make it productive, focused and fun. To set the tone and help people feel more comfortable in the group, kick off with a quick icebreaker. It will help people bond with colleagues they don’t work with daily. Beat the awkward silence at the beginning and wake the inner networker in each participant. Here’s a fun idea inspired by one of our clients. Divide people into groups of 5. Give them 5-10 minutes and ask each group to find 3 things people have in common, e.g., everyone has visited Germany, got children, studied French. One person from each group then submits these as Ideas to Slido with the name of the group attached. Finally, review the submissions with the whole group. For more inspiration, check out these 10 icebreaking activities. A fun icebreaker activity will connect your employees and help them bond with people they don’t know so well. Before launching into information-packed sessions, it’s useful to understand what people want to get out of the offsite. To understand and match people’s expectations, discover what they are. Run a live poll at the start of your offsite to find out which themes people want to learn more about. It will help you uncover the areas people want to focus on, and you can tailor the content accordingly if your agenda allows for some flexibility. For more inspiration, here are 30 example live polling questions split into six categories, each for a different purpose. Numbers, new strategic goals and important changes can be overwhelming. 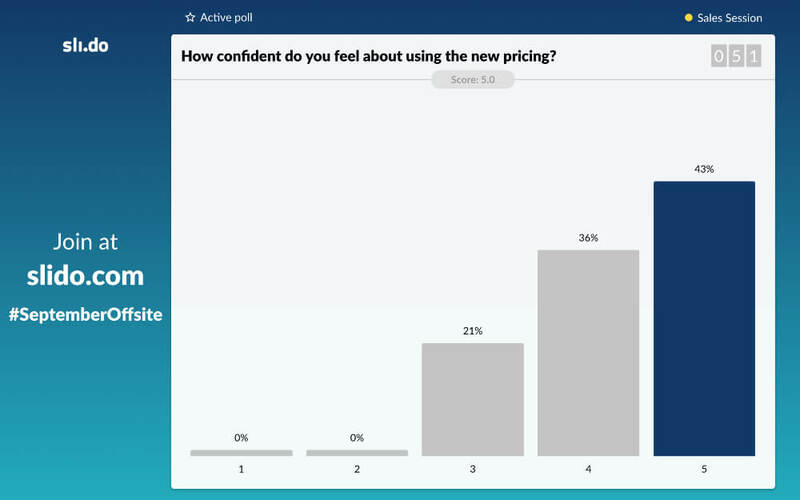 Weave live polls into your presentation to help people digest the new information and identify unclear points. It’s a great way to check if everyone understands what you plan to do and how you’re going to do it and see what people think about the direction. Review the results together to address any concerns. At a recent offsite, our clients presented new pricing and a new sales message. 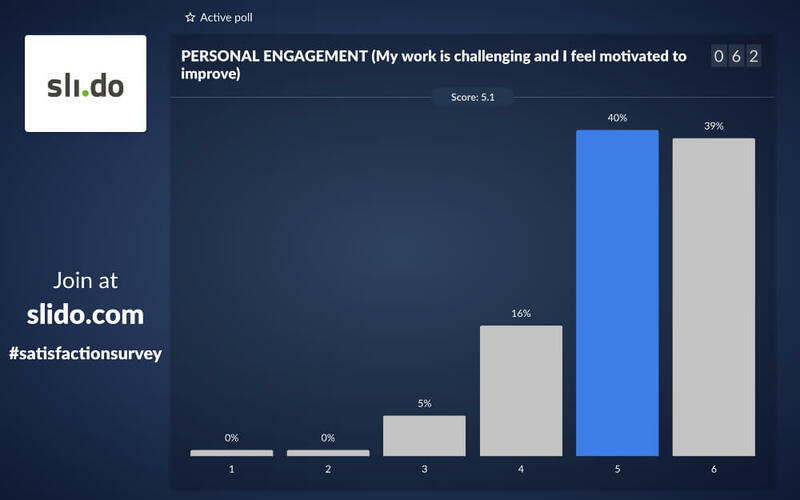 To collect feedback, they created a short survey with rating polls on how confident people felt about implementing these changes. They included open-text fields to give people a chance to elaborate. The feedback helped uncover people’s concerns about potential impacts the changes might have across the company. The survey also produced positive comments and tips for improvement. Asking people how they feel about changes can help you reveal concerns and get tips for improvement. When presented with new plans or change proposals, people also tend to have questions. To address them, build in Q&A time for each session if your offsite agenda allows it. Once people have submitted their questions, get them to upvote the most burning ones and address those first. Sometimes, the packed offsite agenda doesn’t leave time for Q&As. If that’s your case, collect questions via Slido during each session and share the responses in your communications channels after the offsite. It’s a time-effective and logistically easy way of listening, as you don’t have to run around with the mic. Some of our clients organize an “Ask Me Anything” session with their CEO or leadership board as part of their offsite. If you’re planning one, create a separate room on Slido where you can crowdsource questions in advance, during the whole offsite event and live in the room. Tip: To learn what your employees really think, allow them to ask questions anonymously. Addressing your employee’s questions will help you uncover unclear areas and make people feel their voices are heard. Do you want to know how people really feel as part of the company? Take a pulse check with your team and run a Satisfaction Barometer. Create a survey with rating polls about personal excitement, team roles, and learning & development. To give people enough time to answer, share the survey link a week before your offsite and send a few reminders. Review the results together at the offsite and explain how you plan to address the weak areas. The results will help you track and measure improvement over time. With larger teams of 100+ employees, it makes more sense to do it on a departmental or team basis instead. Our team has recently grown to 120, so we have started to run the survey within teams. Smaller groups make it easier to follow up, address the burning issues and ensure that the questions are relevant for each team. Use satisfaction barometer to keep track of how your employees feel as part of the team, uncover critical issues and track improvement. Every offsite should have a clear agenda so people know what to expect and are able to prepare for it. To ensure you address all burning areas, why not ask your team to help you identify the most important areas? Invite them to co-create your offsite agenda. If you have a set of predefined agenda points, let your team vote on the topic that needs the most time in a multiple-choice poll. In case you have space for suggestions, include an open text poll. Ask “What would you like to discuss at the offsite?” and consider adding the topics people submit to the agenda. Extra tip: Let people submit and vote on the topics they want to discuss well before the offsite. It will help you prioritize and prepare the sessions, engaging the participants before they even enter the room. Using open text polls to crowdsource offsite agenda topics with the team will help you ensure that you address all the critical areas. 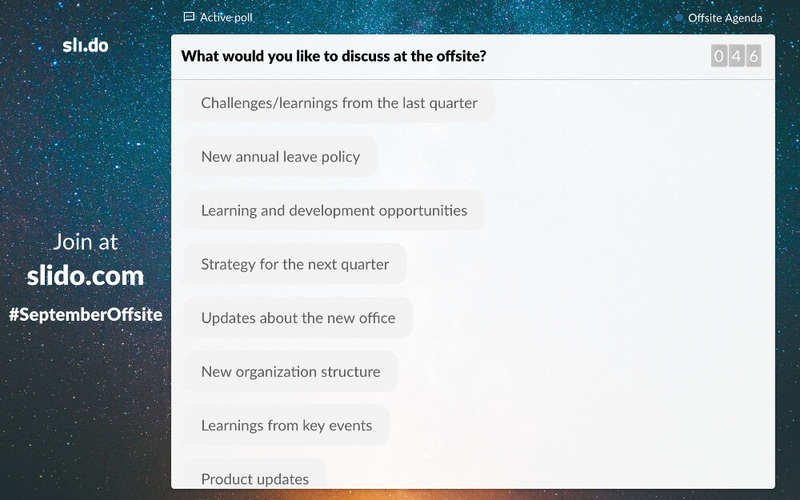 If you’re looking for fresh ideas to revamp your product, collect project suggestions, brainstorm tips for improvement or set new priorities, you can create a dedicated space on Slido to collect people’s input with the Ideas (beta) feature. Some of our clients have used Ideas for brainstorming sessions on values and behaviors with their leadership teams. You can gather people’s input effectively, all in one virtual place. Remote employees can easily join in and take part in brainstorming. 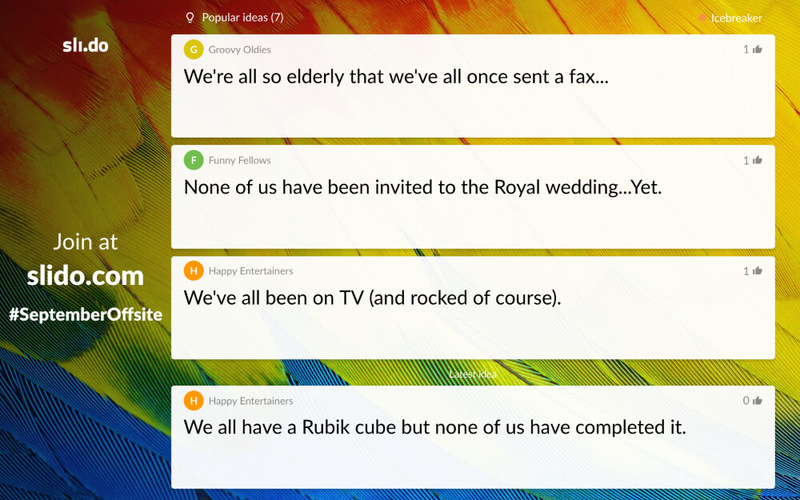 If you use Slack, you can collect ideas without leaving the channel. Having the whole team together in one place is a great opportunity to learn from each other. To make the most of your employees’ collective knowledge and experience, run 30-minute facilitated World Cafe sessions to discuss key topics or projects. Use Ideas to collect topics people want to focus on and let them upvote their favorite ones, be it new projects or the challenges people face at work. 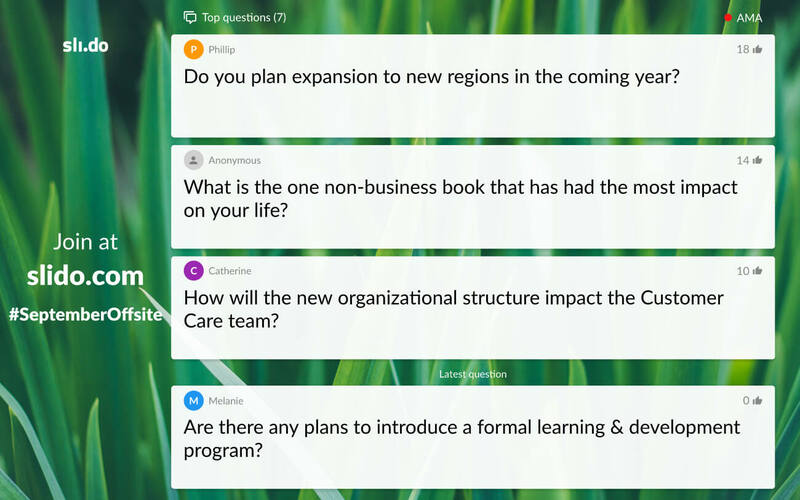 Or if you have a set of predefined topics, use a live poll to let people choose the sessions they want to attend. Then deliver the most popular ones. To share the outcomes with everyone, invite people to submit their learnings via Slido and review them together at the end of the session. It’s especially valuable if your team is distributed globally. This activity will create an effective learning space and allow you to dive deeper into important topics. Let people choose which topics they want to learn about during discussion sessions by voting. Team building and bonding with colleagues is an important part of every offsite. Once the official program ends, you can help people connect by preparing some fun team-building activities. Some of our clients organize talent shows where employees form teams of 3-5 a few days before the offsite. Each team has a few days to prepare a performance or activity, such as dancing or singing. The teams perform for the rest of the company at the end of the offsite. Finally, they use a live poll to vote on the winner of the competition or even run surveys, which allow people to vote on the winners in various categories. Tip: To help the new hires feel part of the team and bond with their colleagues, you can organize a Newbie Quiz in the form of Two Truths and a Lie. Here is a step-by-step guide to how you can do it. To find out which sessions and activities were the most valuable, close your offsite with a quick feedback survey. It’s a great way to collect tips for improvement so you know what you can do better next time. You can export and review all collected data in Analytics. You can ask people to rate how useful they found particular sessions in a rating poll. Or run an open text poll to collect people’s key learnings and takeaways from the offsite. Always ensure you give people space to submit their ideas for improvement. How useful did you find the 2018 priorities overview? How useful did you find the Customer Journey session? What should we start/continue/stop doing in 2019? What do you need in order to measure your success in 2019? Do you have any ideas for improvement (regarding the content, presenters, and flow)? 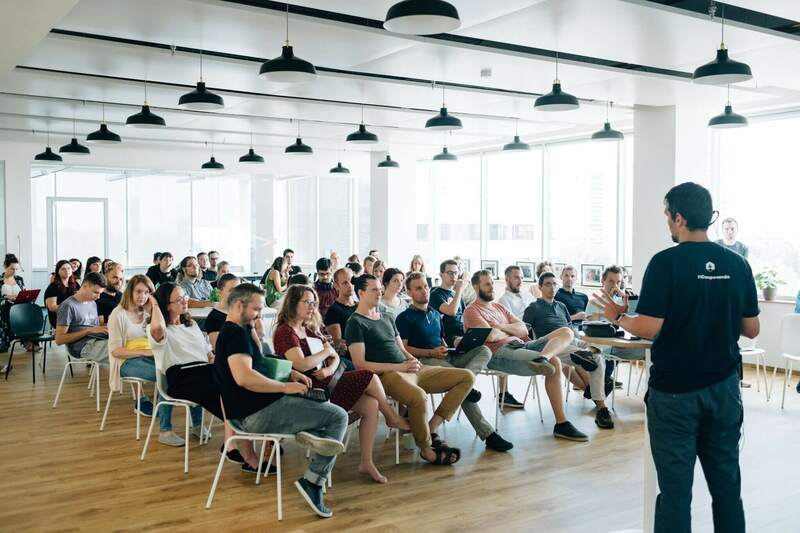 Leverage these tips to help people connect and make your next offsite more effective, focused and enjoyable for your employees.